Classic car shows are almost never just about the cars. They are about passion, big ideas, friendship, and sometimes romance. Heritage Ranch, the active-adult community in Fairview, hosts a classic car show every year on the day following Thanksgiving, weather permitting. This year’s fifth annual event took place on Saturday, November 24 and the weather was glorious with bright sun and temperature in the mid-70’s. “Eighty cars are entered, yielding $592 for Heritage Ranch to contribute to the Salvation Army”, according to Heritage Ranch Community Director Eric Hoyle. 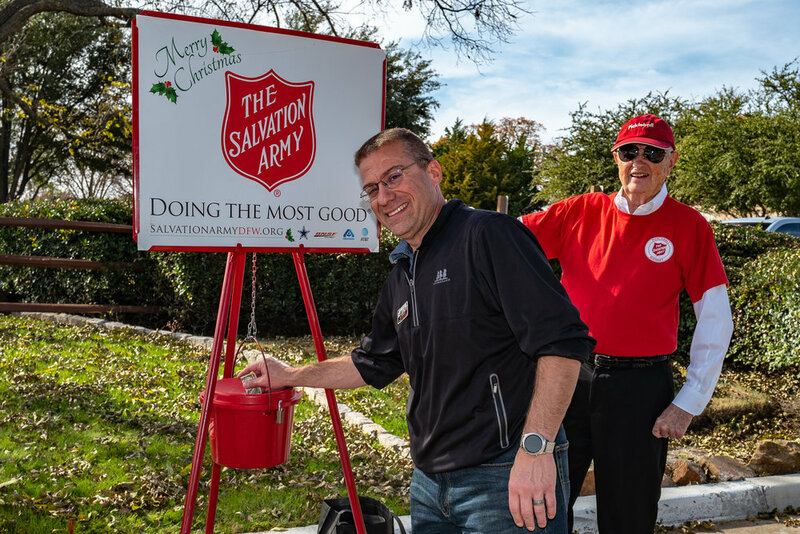 A Salvation Army Red Kettle and crew were on hand to encourage additional contributions. Dan Zadorozny of Lucas has a collection of three classics; a “69 Camaro and two 1934 Ford Coupes including one painted in Blue Bayou. Zadorozny said, “My other ’34 Ford has been meticulously restored to its original condition. But I have restored this one so that I can drive it safely on high-speed highways, something I like to do often.” Zadorozny snagged one of the ’34 Fords from a dealer in Lubbock because of its dry high-desert climate that he explains means, “Absolutely no rust.” Two of his grandsons rode with him to the show in the rumble seat of the car; an adventure that not many grandpas can offer to their grandkids these days. 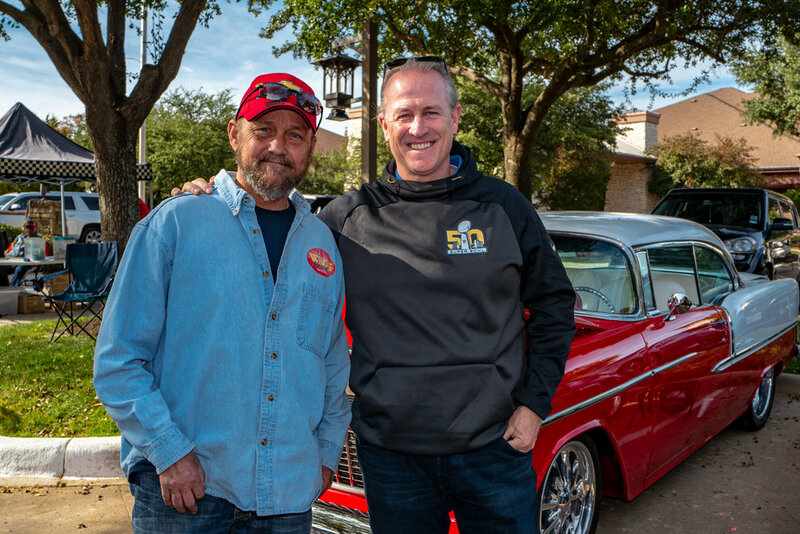 Tim Weeden of Heritage Ranch is now the owner of his fourth 1955 Chevy Coupe. He wrecked his last one on July 4th, 1964. “It’s been a long time between them, but I just had to do it”, he smirked. 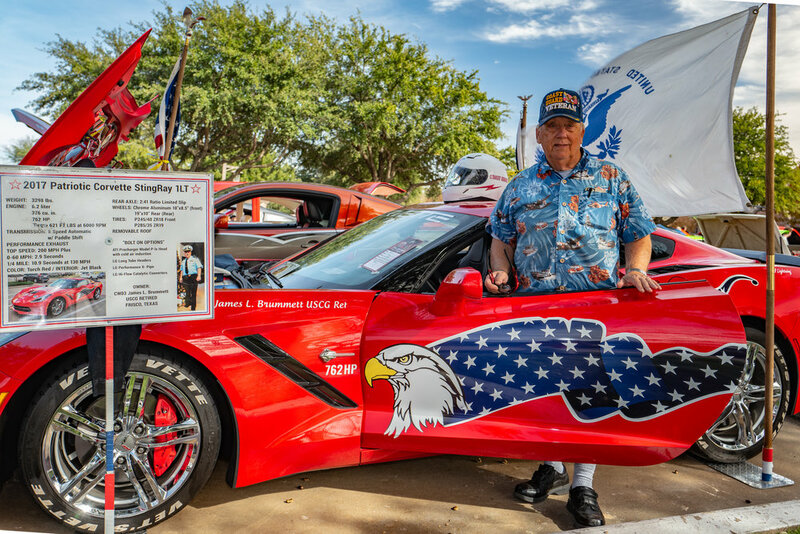 Disabled twenty-one-year veteran of the US Coast Guard (CWO3) James Brummette of Frisco, took First Place in his car’s division with a 2017 Chevrolet Stingray. The car might also have won honors for its ultra-patriotic red, white, and blue motif including a flag-covered hood and bald eagles on both doors. Brummett also boosted the performance of the car which now growls along thanks to its 762-HP engine. One of the most unique autos (and stories about it) on display was Joe Pell’s 1986 Ford Mustang DPS Squad car. Pell, of Melissa, often rode along in high school with DPS Trooper Mark Collins of Grayson County. The car was rebuilt in Kansas and was then sold to a collector in Kentucky. Pell bought it there and then recruited DPS Trooper Collins to help him restore the car to original condition. With five cars on display, Mark Baker of Heritage Ranch (His home includes a custom-built six car garage complete with a lift), must take the prize for the most extraordinary collection of very high-valued classics at the show. The collection begins with a 2000 Corvette whose only original parts are its chassis and frame; a 2008 Mercedes Benz Smart car with flame graphics that alone cost $10,000; a 1967 Ford Mustang that is number 19 of a limited-factory run of just 25 cars. Eleven of the cars were ear-marked for the movie, “Gone in Sixty Seconds”. The estimated value of this car alone is about $250,000; a 1955 Chevy 201, again with nothing original remaining except the chassis and the frame. But this unique beauty contains a one-of-a-kind hand-painted image of Marilyn Monroe on its carburetor and a hand-stitched red and white leather interior more sumptuous than the finest hand-made leather handbag; finally, a 2005 Foose Mustang that is one of only two produced by the famous one-off designer of Mustangs, Chip Foose whose creations commonly sell for hundreds of thousands of dollars. The eighty cars at the show brought out hundreds of fascinated visitors and created lots of cheer for the Salvation Army. It also hosted an army of friends who meet frequently to proudly display their treasures at classic car shows.